In the present study, a survey of marine sponges for biodiversity and distribution was done along three substations; Sheva creek, Peerwadi coast and Dharamtar creek of Uran coast (Raigad), Navi Mumbai, west coast of India. Sponge samples were collected from intertidal regions and shallow coastal waters monthly from June 2013 to May 2015 during spring low tides. A total of 16 species of sponges representing 12 genera, 10 families and 8 orders were identified. Of these, 13 species belongs to class Demospongiae, 2 to Calcarea and 1 to Hexactinellida. Maximum species diversity of sponges is recorded at Peerwadi coast than Sheva creek and Dharamtar creek. Fewer species diversity at Sheva creek and Dharamtar creek is attributed to the close proximity of these sites to human population, non-availability of suitable rocky stretches for settlement and colonization and to maritime activities of Jawaharlal Nehru Port Trust (JNPT). Sponges from Uran coast are under stress due to discharge of domestic wastes and sewage, effluents from industries, oil tanking depots, maritime activities of Jawaharlal Nehru Port Trust (JNPT) and hectic activities of Container Freight Stations (CFS). This study reveals that marine sponges from Uran coast are facing the threat due to industrial pollution and anthropogenic stress. The oceans cover about 70% of the earth’s surface, and the marine environment includes tremendous biodiversity; all but two of the 28 major animal phyla are represented (Schwartsmann et al., 2001). Marine sponges (Porifera) are the oldest metazoan group and characterized as sessile active filter feeders and (Hausmann et al., 2006). Phylum Porifera is subdivided into three classes’ i. e. the Calcarea (calcarious sponges with three-rayed spicules of calcium carbonate), the Demospongiae (skeleton of siliceous spicules) and the Hexactinellida (glass sponges with skeleton of six-rayed siliceous spicules). The Demospongiae contains the vast majority of extant sponges living today and represent 85-90% of the global sponge fauna (Thakur and Muller, 2004). 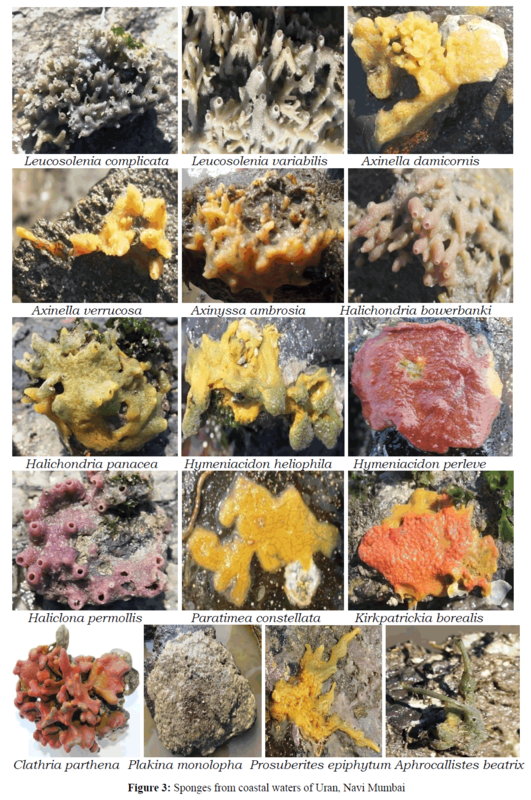 The knowledge on sponge biodiversity is still largely incomplete and to date, 8517 valid species of sponges are enlisted in the World Porifera Database (Van Soest et al., 2014). A total of 486 species of marine sponges have so far been described from the Indian waters (Thomas, 1998; Venkataraman and Wafer, 2005). Sponges show an amazing variety of shapes, sizes and colours (Thakur and Muller, 2004). Undisturbed natural substrates like coral rubbles, rocks and abandoned shells have always supported for the settlement and growth of sponges (Ramakritinan et al., 2015). Sponges have an ability to filter four to five times their own volume every minute. The water current supplies food particles and oxygen and removes metabolic waste products (Cristiane et al., 2014; Vinod et al., 2014). Sponges feed by extracting suspended or dissolved food from the surrounding water, using flagellated cells, known as ‘choanocytes’ (Hausmann et al., 2006). Easson et al. (2015) reported that sponges perform critical functional roles in marine ecology like directly contribute to energy cycling by efficiently clearing dissolved organic carbon, bacteria and pathogens from the water column (De Goeij et al., 2013), incorporating energy sources into the benthic system (Hadas et al., 2006), contribute to primary productivity (photosynthesis) and nutrient cycling in marine environment (Easson et al., 2015), important dietary composition of marine organisms (Barbara et al., 2007, important energy coupling between the benthic and pelagic communities (Duckworth and Wolff, 2007) and binding live corals to the reef frame, regeneration of broken corals and harbouring nitrifying and photosynthesizing microbial symbionts or intervening in erosion processes (Raghunathan et al., 2014). Marine sponges have a high frequency of bioactive components for their chemical defences against environmental stress factors such as predation, overgrowth by fouling organisms or competition for space (Perdicaris et al., 2013). They are the richest sources of pharmacologically active compounds found in the marine environment. These bioactive molecules are known as ‘secondary metabolites’ (Sagar et al., 2010). Perdicaris et al. (2013) documented that marine sponges produce an enormous array of antitumor (Belarbi et al., 2003), antiviral (Sagar et al., 2010), antiinflammatory (Sipkema et al., 2005), immunosuppressive (Perdicaris et al., 2013), antibiotic (Anand et al., 2006; Jirge and Chaudhari, 2010), antifungal (Dhinakaran et al., 2012; Palpandi et al., 2013), cytotoxic (Mollica et al., 2012), antimalarial (Ravichandran et al., 2007) and other bioactive molecules (anticoagulant, antifouling, antioxidants, hypocholesterolemic, cardiovascular and muscle relaxants) that have the potential for therapeutic use. Sponges are good bioindicators and are convenient tools for characterizing the state of a marine ecosystem (Berthet et al., 2005). Sponge communities can live same locality and are capable of accumulating metals for a long period; hence they have been chosen as indicators to reveal the environmental crises of a selected area (Vogel, 1977; Rao et al., 2009). Sponges have been recommended as a suitable biomonitor species for metal pollution because of their strong ability to concentrate metals in their tissues (Cebrian et al., 2007; Pan et al., 2011). Sponges are strongly associated with the abiotic environment, very sensitive to environmental stress and are useful tools for environmental monitoring. Chemical monitoring alone is not enough and that pollution is essentially a biological phenomenon because its impact is on having organisms. Stress induces qualitative and quantitative changes in the structure of communities which can usually be assessed by analyzing diversity and relative abundance (Carballo et al., 1996). The coastal environment of Uran has been under considerable stress since the onset of industries like Oil and Natural Gas Commission (ONGC), LPG Distillation Plant, Grindwell Norton Ltd., Gas Turbine Power Station (GTPS), Bharat Petroleum Corporation Limited (BPCL) Gas Bottling Plant, Jawaharlal Nehru Port (JNPT, an International Port), DP World, Container Freight Stations (CFS), etc. These activities affect the ecology of sponges from Uran coast, Navi Mumbai (Pawar, 2013; Pawar, 2015). Although many studies have been undertaken to evaluate the species diversity of sponges in India, no scientific studies have been carried out on the species composition of sponges of Uran, Navi Mumbai; hence, the present study is undertaken. Objective of the study is to evaluate the impact of anthropogenic inputs on species composition of sponges with respect to tidal and seasonal variability. Geographically, Uran (Lat. 18º50'5'' to 18º50'20'' N and Long. 72º57'5'' to 72º57'15'' E) with the population of 23,254 is located along the eastern shore of Mumbai harbor opposite to Coloba. Uran is bounded by Mumbai harbor to the northwest, Thane creek to the north, Dharamtar creek and Karanja creek to the south, and the Arabian Sea to the west. Uran is included in the planned metropolis of Navi Mumbai and its port, the Jawaharlal Nehru Port (JNPT) (Figure 1). The coast of Uran is a tide-dominated and the tides are semidiuranal. The average tide amplitude is 2.28 m. The flood period lasts for about 6-7 h and the ebb period lasts for about 5 h. The average annual precipitation is about 3884 mm of which about 80% is received during July to September. The temperature range is 12-36ºC, whereas the relative humidity remains between 61% and 86% and is highest in the month of August. The present study was carried out for a period of two years, i.e., from June 2013 to May 2015. Three study sites namely Sheva Creek, site I (Lat.18º 50' 20'' N and Long. 72º 57' 5'' E), Peerwadi coast, site II (Lat.18º 50' 10'' N and Long. 72º 57' 1'' E) and Dharamtar Creek, site III (Lat.18º 48' 3'' N and Long. 72º 58' 31'' E) separated approximately by 10 km were selected along the coast. The study sites were surveyed monthly during spring low tides from June 2013 to May 2015 and sponge samples were collected from intertidal regions and shallow coastal waters. Surveys were carried out to record the diversity of sponges and they were removed from the substrate with a chisel and protective gloves. Sponges were collected in clean polythene bags; one sample per bag and microphotographs of the sponges were taken with Cannon EOS1100D digital camera and they were brought to the laboratory. In the laboratory, morphological characteristics of each specimen including size, shape, colour, texture, total length, and breadth and osculum diameter were recorded (Vinod et al., 2014). The specimens were washed under tap water and then fixed in 10% formaldehyde-seawater solution and then transferred into 70% ethanol. Preparation of spicules and skeletons was made as per methods recommended by Rutzler (1978) and Evcen and Çinar (2012). Preparations of spicules were made by dissolving sponge fragments in boiling nitric acid, and after rinsing in water and ethanol, spicules were observed under microscope and classification of spicules was made as per work of Hooper and Van Soest (2002) and Evcen and Çinar (2012). Sponges were identified following the standard taxonomic keys of Picton (2007), Venkataraman et al. (2012) and Van Soest et al., (2014). A total of 16 species of sponges representing 12 genera, 10 families and 8 orders were recorded from Uran coast (Table 1) and (Figure 3). Of the recorded species, 13 species belongs to class Demospongiae, 2 to Calcarea and 1 to Hexactinellida. The percentage distribution (by order) of sponges recorded from Uran coast (Figure 2) showed that the Order Halichondrida had the highest species composition (31.25%), followed by Leucosolenida, Axinellida, Hadromerida, and Poecilosclerida each with 12.5%. The Order Haplosclerida, Homosclerophorida and Hexactinosida had a composition of 6.25% species in each. Table 1: Species of sponges recorded from Uran, Navi Mumbai. Site wise distribution and species richness of sponges is shown in Table 2. Maximum species diversity of sponges was reported at Peerwadi coast (16 species), followed by Dharamtar creek (9 species) and Sheva creek (4 species). Table 2: Distribution of sponges from Uran coast, Navi Mumbai. The Peerwadi coast is characterized by rocky stretches which would provide suitable substratum and appropriate habitat for easy settlement of the larval forms and better colonization of sponges (Vinod et al., 2014). Abdul Wahab et al. (2014) and Ramakritinan et al. (2015) have noted that undisturbed natural substrates like coral rubbles, rocks and abandoned shells have always supported for the settlement and growth of sponges. This is also attributed to the water flow; because increased water flow provides greater availability of suspended food (Duckworth and Battershill, 2003). Bell and Barnes (2000) reported that water flow, wave action and current speed acts as limiting factors for growth of sponges and slower growth of sponges in recorded in weak currents. Easson et al. (2015) shows that, in Bocas del Toro, Panama, a sponge community in close proximity to human populations consisted of fewer species whereas the community at a site distant from human development included a more diverse assemblage of species. Sheva creek has extensive mudflats with less rocky substratum. Establishments like Jawaharlal Nehru Port (JNPT), DP WORLD, Naval Armament Depot (NAD), Grindwell Norton Ltd., Indian Oil Tanking (IOT), Container Freight Stations (CFS), Trawler building workshops etc. are located in the stretch of the creek. Also, Gharapuri Island (Elephanta caves, a famous tourist spot) is present on the north side of the creek. The creek receives wastes and effluents from Asia’s largest industrialized zone namely Thane Belapur industrialized area along with the Navi Mumbai Urban area (Pawar, 2013). Poor species diversity of sponges at Sheva creek could be attributed to the environmental stress faced by the sponges due to disturbed water quality variables and maritime activities of JNPT, sewage and effluents from port related establishments and non-availability of rocky and coral substratum (Pawar, 2015). Similar results were also reported by Carballo et al. (1996) at Algeciras Bay, Goh (2008) in coasts of Singapore, Rao et al. (2009) in the coasts of Gulf of Mannar, India and Pan et al. (2011) at Eastern Coast of the Red Sea, Saudi Arabia. Dharamtar creek is the confluence of Karanja creek, Patalganga River and Amba River, opening into southern part of Mumbai harbor. Intertidal region of Dharamtar creek is with rocky and coral substratum towards the Dronagiri Mountain whereas remaining part of the creek is dominated by the marshy areas and mud flats. Towards the Revas side, upper littoral zone is sandy and remaining part of the creek is marshy with mud flats. The rocky substratum of Dharamtar creek supports moderate species diversity of sponges. This is attributed to the waste water received from petrochemical complex and other industries that opens into Dharamtar creek (Pawar and Kulkarni, 2007). A biomonitor should be able to accumulate a considerable concentration of contaminant in relation to the average contaminant concentration in its ambient environment (Pan et al., 2014). As sponges are sessile and sensitive to environmental stressors (including elevated nutrient concentration), they acts as excellent bioindicator species of environmental stress (Carballo et al., 1996; Rao et al., 2009; Easson et al., 2015). Percentage species composition of sponges at Uran coast shows maximum number of species from class Demospongiae than Calcarea and Hexactinellida. It could be correlated to the availability of rocky stretches, favorable physical factors, such as water turbidity, salinity, wave exposure, substrate availability, tidal ranges, and biological factors such as competition, larval supply, and predation (Diaz, 2005). Results of the study are in agreement with earlier reports of Putchakarn (2011) along Chanthaburi and Trat Provinces, the eastern coast of the Gulf of Thailand, Ramkumar et al (2013) in South Andaman, Raghunathan et al. (2014) in Andaman and Nicobar Islands and Vinod et al. (2014) in Enayam to Kollam, India. During present study, maximum number of sponge species belonging to class Demospongiae (81.25%) was recorded followed by Calcarea (12.5%) and Hexactinellida (6.25%). Results of the study are in agreement with Thai (2013) from coastal waters of Vietnam where of the 299 sponge species identified, class Demospongiae represents highest number of species (281 species occupying with 94% of the total). The coastal environment of Uran has been under considerable stress due to onset of JNPT and other industries since 1989. Hectic activities of Container Freight Stations (CFS), urbanization, industrialization, and reclamation on the coast around Uran result in the loss of mangrove biodiversity. Several incidences of coastal pollution occur because of leakage/discharge of transporting materials along with industrial effluents (Pawar, 2013). Since no earlier reports are available on taxonomy and species diversity of sponges from Uran coast, data presented here can be taken as a baseline data in knowing the status of sponges from Uran coast and effect of industrial development on it and for a better management of marine sponges. This study shows that the Uran coast harbors a diverse group of marine sponges. Species composition of sponges reveals that species belonging to class Demospongiae were dominant over the Calcarea and Hexactinellida. The study also demonstrates that sponge community in close proximity to human populations consists of fewer species whereas the community at a site distant from human development shows more diverse assemblage of species. The variation in abundance of species could result from biological and physical factors such as localized disturbance events, differences in food availability and patterns of water transport affecting larval dispersal. Discharge of sewage, industrial wastes, effluents, maritime activities of Jawaharlal Nehru Port (JNPT), Container Freight Stations (CFS) and anthropogenic stress will affect the species diversity of sponges from Uran coast in near future. Present information on species diversity of sponges would be helpful as a baseline data for further monitoring of anthropogenic inputs on sponges from Uran coast. Financial support provided by University Grants Commission, New Delhi (File No: 42–546/2013 (SR) dated 22nd Mar 2013) is gratefully acknowledged. The author is thankful to The Principal, Veer Wajekar Arts, Science and Commerce College Mahalan Vibhag, Phunde (Uran), Navi Mumbai 400 702 for providing necessary facilities for the present study. Special thanks to Dr. Rahul B. Patil for providing healthy cooperation during field visits for photography of the study sites and sponges. Thanks are due to Mr. Sanket S. Shirgaonkar, who worked as a Project Fellow for the present study. Thanks to Dr. Atul G. Babar for the help rendered during preparation of location map of study area. Abdul, W. M. A., de Nys, R., Webster, N. and Whalan, S., 2014. Larval behaviours and their contribution to the distribution of the intertidal coral reef sponge Carteriospongia foliascens. PLoS ONE. 9: 1-13. Anand, T., P., Abdul W. B., Yogesh, S. S., Upal, R. and Sarma J. S. A. P., 2006. Antimicrobial activity of marine bacteria associated with sponges from the waters off the coast of South East India. Microbiol. Res. 161: 252-262. Barbara, R. A., Daniela, B., Cláudio, L. S. S. and Muricy, G., 2007. Spongivory by juvenile angelfish (Pomacanthidae) in Salvador, Bahia State, Brazil. In: Custódio, M. R. et al. (Eds. ), Porifera Research: Biodiversity, Innovation and Sustainability, Rio de Janeiro: Museu National, pp: 131-137. Belarbi, E., H., Antonio, C., G., Yusuf, C., Francisco G. C. and Emilio, M. G., 2003. Producing drugs from marine sponges. Biotechnol. Adv. 21: 585-598. Bell, James, J., David, K. A. B., Jones, M. B., Azevedo, J. M. N., Neto, A. I., Costa, A. C. and Frias, M. A. M., 2000. A sponge diversity centre within a marine 'island' (Eds). Ocean and Deep-Sea Biology. Hydrobiologia. Kluwer Academic Publishers, Netherlands, 440: 55-64. Berthet, B. B., Catherine, M. C., Thierry, P. T. and Amiard-Triquet, C., 2005. Metallothionein concentration in sponges (Spongia officinalis) as a biomarker of metal contamination. Comp. Biochem. Physiol. C Toxicol. Pharmacol. 141: 306-313. Carballo, J. L., Naranjo, S. A. and Garcia-Gomez, J. C., 1996. Use of marine sponges as stress indicators in marine ecosystems at Algeciras Bay (southern Iberian Peninsula). Mar. Ecol. Prog. Ser. 135: 109-122. Cebrian, E., Uriz, M. and Turon, X., 2007. Sponge as biomonitors of heavy metals in spatial and temporal surveys in northwestern mediterranean: multispecies comparison. Environ. Toxicol. Chem. 26: 2430-2439. Hardoim, C. C. and Costa, R., 2014. Microbial communities and bioactive compounds in marine sponges of the family irciniidae-a review. Mar. Drugs. 12: 5089-5122. De Goeij, J. M., Van, O. D., Vermeij, M. J., Osinga, R., Middelburg, J. J., De Goeij A. F. and Admiraal, W., 2013. Surviving in a marine desert: the sponge loop retains resources within coral reefs. Science. 342: 108-110. Dhinakaran, D. I., Manohari, V., Atchya, B., Tamilselvi, K. and Lipton, A. P., 2012. Antifungal and Cytotoxic Activities of Some Marine Sponges Collected from the South East Coast of India. J. Applied. Pharmaceut. Sci. 2: 52-55. Diaz and Cristina, M., 2005. Common Sponges from Shallow Marine Habitats from Bocas del Toro Region, Panama. Caribbean. J. Sci. 41: 465-475. Duckworth, A. R. and Carsten, W. W., 2007. Patterns of abundance and size of Dictyoceratid sponges among neighbouring islands in central Torres Strait, Australia. Marine. Freshwate.r Res. 58: 204-212. Duckworth, A. R. and Battershill, C. N., 2003. Sponge aquaculture for the production of biologically active metabolites: the influence of farming protocols and environment. Aquaculture 221: 311-329. Easson, C. G., Kenan, O. M., Christopher, J. F., Stephanie, K. A. and Robert, W. T., 2015. Variation in species diversity and functional traits of sponge communities near human populations in Bocas del Toro, Panama. Peer. J. 3: e1385. Evcen, Alper and Melih E. Ç., 2012. Sponge (Porifera) species from the Mediterranean coast of Turkey (Levantine Sea, eastern Mediterranean), with a checklist of sponges from the coasts of Turkey. Turk. J. Zool. 36: 460-464. Goh, B., Murakami, Y., Nakayama, K., Kitamura, S. I., Iwata, H. and Tanabe , S., 2008. Research on Ecotoxicology and Applications in Singapore: Description of the Sponge Aggregation Assay (Eds): Interdisciplinary Studies on Environmental Chemistry-Biological Responses to Chemical Pollutants. pp. 17-29. Hadas, E., Marie, D., Shpigel, M. and Ilan, M., 2006. Virus predation by sponges is a new nutrient-flow pathway in coral reef food webs. Limnology and Oceanography 51: 1548-1550. Hausmann, R., Marco, P. V., Frank, L. and Christoph, S., 2006. Advances in the production of sponge biomass Aplysina aerophoba-A model sponge for ex situ sponge biomass production. J. Biotech. 124: 117-127. Hooper, J. N. A. and Van Soest, R. W. M., 2002. Systema Porifera: A Guide to the Classification of Sponges. Kluwer Academic/ Plenum Publishers, New York, pp: 1103-1706. Supriya, S. J. and Chaudhari, Y. S., 2010. Marine: The Ultimate Source of Bioactives and Drug Metabolites. Int. J. Res. Ayurveda. Pharmacy. 1: 55-62. Mollica, A., Marcello, L., Azzurra, S. and Francesco, P., 2012. Synthesis and Bioactivity of Secondary Metabolites from Marine Sponges Containing Dibrominated Indolic Systems. Molecules. 17: 6083-6099. Palpandi, C., Suganthi, K. and Ganavel, A., 2013. Antifungal activity of some species of marine sponges (class: Demospongiae) of the palk bay, southeast coast of India. 5: 409-413. Pan, K., Lee, O. O., Qian, P. Y., Wang, W. X., 2011. Sponges and sediments as monitoring tools of metal contamination in the eastern coast of the Red Sea, Saudi Arabia. Mar Pollut Bull. 62: 1140-1146. Pawar, Prabhakar, R. and Balasaheb, G. K., 2007. Assessment of water quality in Karanja creek (Dist-Raigad), Maharashtra, West coast of India. J. Ecophysiol. Occup. Hlth. 7: 61-72. Pawar and Prabhakar, R., 2013. Monitoring of impact of anthropogenic inputs on water quality of mangrove ecosystem of Uran, Navi Mumbai, west coast of India. Mar. Poll. Bull. 75: 291-300. Pawar and Prabhakar, R., 2015. Monitoring of Pollution Using Density, Biomass and Diversity Indices of Macrobenthos from Mangrove Ecosystem of Uran, Navi Mumbai, west coast of India. J. Bioremed. Biodeg. 6: 299. Picton and Bernard, E., 2007. Sponges of the British Isles (“Sponge V”). Marine Conservation Society pp: 165. Putchakarn and Sumaitt 2011. Species Diversity of Marine Sponges along Chanthaburi and Trat Provinces, the Eastern Coast of the Gulf of Thailand. Publ. Seto. Mar. Biol. Lab. 41: 17-23. Raghunathan, C., Raghuraman, R., Immanuel, T. and Venkataraman, K., 2014. Diversity of coral reef associated sponges in Andaman and Nicobar Islands. Uttar Pradesh State Diversity Board pp: 31-38. Ramakritinan, C. M., Ramkumar, B. and Kumaraguru, A. K., 2015. Growth of sponges around nylon rope and E-waste in the coastal water of Veedhalai, Gulf of Mannar, India. Int. J. Curr. Microbiol. App. Sci. 4: 61-65. Ramkumar, B., Venu, S., Ramakritinan, C. M. and Jayasingh, M., 2013. Distribution and abundance of Marine Sponges (Porifera) of two unique study areas of South Andaman, India. Asian J. Mar. Sci. 1: 17-23. Rao, J. V., Srikanth, K., Ramjee, P. and Gnaneshwar, T. R., 2009. The use of marine sponge, Haliclona tenuiramosa as bioindicator to monitor heavy metal pollution in the coasts of Gulf of Mannar, India. Environ. Monit. Assess.156: 451-459. Ravichandran, S., Kathiresan, K. and Hemalatha, B., 2007. Anti-malarials from marine sponges. Biotechnol. Mol. Biol. Rev. 2: 033-038. Rutzler, K. Stoddart, D. R. and Johannes, R. E., 1978. Sponges in coral reefs. In: Coral Reefs: Research Methods (Edn), UNESCO, Paris, pp. 209-313. Sagar, S., Kaur, M. and Minneman, K. P., 2010. Antiviral lead compounds from marine sponges. Mar Drugs. 8: 2619-2638. Schwartsmann, G., Rocha, A. B. D., Berlinck, R. G. S. and Jimeno, J., 2001. Marine organisms as a source of new anticancer agents. Lancet Oncol. 2: 221-225. Sipkema, D., Franssen, M. C., Osinga, R., Tramper, J. and Wijffels, R. H., 2005. Marine sponges as pharmacy. Mar. Biotechnol. (NY) 7: 142-162. Thai and Quang, K., 2013. A Review of the diversity of sponges (Porifera) in Vietnam. In The 2nd Int. Workshop on Marine Bioresources of Viet Nam. Pp: 109-115. Thakur, Narsinh, L. and Werner, E. G. M., 2004. Biotechnological potential of marine sponges. Curr. Sci. 86: 1506-1512. Thomas, P. A., 1998. ENVIS ZSI, Kolkata pp: 27-36. Soest, V. R. W. M., Boury-Esnault, N., Hooper, J. N. A., Rutzler, K. D. V. N. J., Glasby, B. A. D., Hajdu, E., Pisera, A. B., Manconi, R., Schoenberg, C., Janussen, D., Tabachnick, K. R., Klautau, M., Picton, B., Kelly, M., Vacelet, J., Dohrmann, M., Cristina Díaz, M. and Cardenas, P., 2014. World Porifera Database. Venkataraman, K., Raghunathan, C., Raghuraman, R. and Sreeraj, C. R., 2012. Marine Biodiversity pp: 1-164. Venkataraman, K. and Wafer, M., 2005. Coastal and marine biodiversity of India. Indian J. Mar. Sci. 34: 57-75. Vinod, K., George, R. M., Thomas, P. A., Mary, K. M. and Shylaja, G., 2014. Diversity and distribution of shallow water sponges (Porifera) in the coastal waters from Enayam to Kollam, south-west coast of India. Indian J. Fish. 61: 52-57. Vogel, S., 1977. Current-induced flow through living sponges in nature. Proc. Natl. Acad. Sci. USA. 74: 2069-2071.